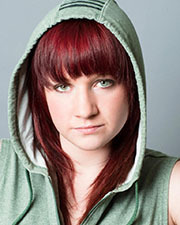 Andie Stitt grew up in Kansas City, Kansas where she began dance training at the age of four. She took from many different teachers at studios, conventions, camps and workshops throughout her elementary years. In high school, she was given the experience of a lifetime to travel with a well-known convention to assist famous choreographers. She continued training at numerous studios, and decided to take her dance knowledge to the next level by attending Wichita State University to become a dance major. In May of 2014, Andie graduated from Wichita State with a BFA focused in dance. Since then, Andie has had countless amazing opportunities. She was hired directly out of Wichita State’s dance program as an adjunct professor. She recently got a job at Arts Partners as a teaching artist. With the help of Arts Partners, she travels to low-income schools, and teaches dance to at risk children. She spends most weekends traveling and teaching master classes or camps at studios throughout the Midwest. At the University of Kansas she teaches Hip-Hop and a Rhythm Tap. She is honored and humbled to have the opportunity to work with so many talented dancers young and old.